I haven’t been watching the Barefoot Contessa the way I used to. There’s something I can’t quite define about the current season of her show that I’m not enjoying. But I happened to be watching the episode where she had Devon Fredericks on making her award winning chili and no sooner was the show over than I was online printing out the recipe. I don’t know how many people Ms. Fredericks usually cooks for or how big her dutch oven is, but there was no way I could make the recipe without scaling it down. Gallons of anything is not a scale I feel comfortable working in and I personally don’t have a single pot that would hold that much chili. So I made my adjustments and got to cooking. Now I knew that this recipe needed a long cooking time so I purposely got to work early in the day. I like to exaggerate a little so I tweeted that I was making some crazy 6 Hour Chili. And then about two hours later once everything was cut, seared, stirred, and the chili was actually simmering away I went back to twitter and said that this should have been called “6 Hour, 2 cutting board, 5 bowl, every utensil you have will be dirtied chili” because of the mass destruction the recipe unleashed in my kitchen. At least I had a good long time to clean up the mess. A few loads of dishes later, the chili was still simmering away at which point I decided that instead of calling it 6 Hour Chili, I ought to call it Commitment Chili because deciding to make the recipe calls for you to commit to get from start to finish. There aren’t any shortcuts with this recipe. Not in the time it takes. And not in the ingredients you use. So if you have a fear of commitment, then perhaps you should avert your eyes now. Because once I say that this was some of the best chili I’ve ever eaten, you’re going to want to know how to make it. And I can’t be held responsible for what actions you take after that. …Ok, this was some of the best chili I’ve ever eaten. It was worth the 6 hours, 2 cutting boards, 5 bowls, and every utensil it took to get that beautiful bowl of chili. It was also worth the $20 I spent on brisket. Like I said, there are no shortcuts. 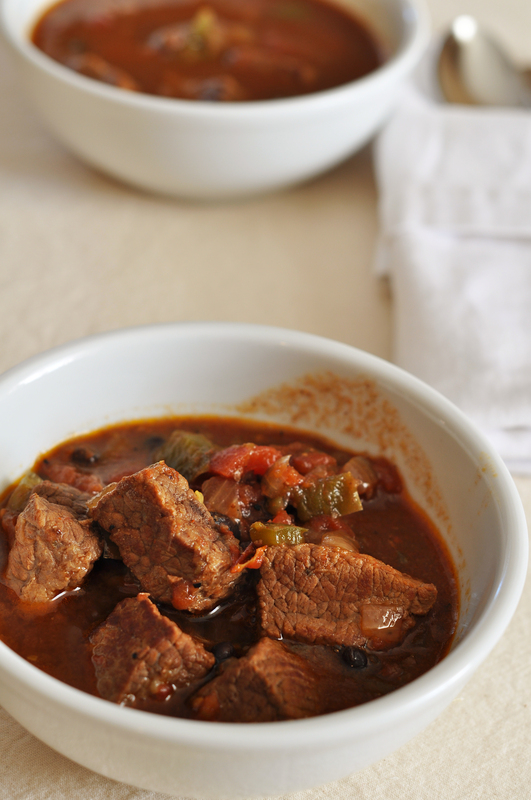 And the brisket is really what sets this chili apart for me. The big hunks of tender beef make this a dish that I would be proud to serve to company. For real, if I say that I’m making 6 Hour Chili, you need to find out what time dinner is served and then just happen to be in my neighborhood around that time. BAH Note: Even after adjusting the amount of cayenne, chili powder, and red pepper flakes I used, the chili still packed a lot of heat. The next time I make it, I need to find a way to cut back further on the spice. Because no meal is enjoyable if it overwhelms you. And you can always add more spice but once it’s in there, it’s in there. BAH Note PS: After this post published I had a few folks say that the likely culprit for the level of heat was the cayenne. Next time I’m going to turn down the cayenne to about 1/4 teaspoon and see where that gets me. Kathy recommended “several tablespoons of ancho and regular commercial chili powder plus I throw in a couple of whole jalapenos and my chili is only vaguely hot” and over on Facebook Wendy said “The 1 tsp cayenne is absolutely blistering. Cut that back to 1/4 tsp and use additional chiles – I use a blend of chiptole for spice, smoke, and fruitiness, ancho for richness, pasilla and guajillo for a prunelike fruitiness”. Thanks ladies. I can’t wait to implement these ideas. Pat the brisket dry with paper towels, cut into 1 inch cubes, and season with salt and pepper. Heat half the oil in a dutch oven over medium heat and sear the beef in batches, adding more oil as needed. Transfer the seared beef to a separate bowl. Saute the onion and garlic in the same pan until softened, approximately 5 to 8 minutes. Add the chili powder, red pepper flakes, cayenne, and cumin to the pan and cook for 1 minute. Add the green pepper, bay leaf, tomatoes and juices, and the seared beef to the pan. Bring to a boil, cover the pot with a lid, and reduce the heat to a simmer. Simmer for 2 1/2 hours, stirring occasionally. After 2 1/2 hours, stir in the coffee, add salt and pepper to taste, cover and simmer for another hour. Add the beans, stir to warm through, and serve. You had me until the strong coffee. Really? Coffee?? Ummm…. ewww. Could you taste it in the chili at all behind all those spices? Jennifer, you don’t taste the coffee at all. Kind of like how coffee enhances the flavor of chocolate in a very subtle way, it’s the same principle here. Of course, you could always leave it out. Fortunately, once everything is prepped and in the pot, the chili takes care of itself. But cleaning up took me a while. I was not kidding about how many pots I dirtied in the name of chili. Mushroom lasagna? Tell me more. I think I’d leave it out. I don’t even like coffee with chocolate. Jennifer, glad to know I’m not the only one who makes tremendous messes in the kitchen in the name of dinner. I’ve got to back you on coffee in chili. It seemed so bizarre an idea the first time I saw it, but it really adds something. This recipe just reads like something I want. I am glad for the independent confirmation about the magic of coffee in chili. If you start cooking now, all the dishes can be done and you could be dining by about 10pm. Call it a very late supper. I think the 1 teaspoon of cayenne is what made your chili so hot. I usually use several tablespoons of ancho and regular commercial chili powder plus I throw in a couple of whole jalapenos and my chili is only vaguely hot. Here’s my recipe, if you’re interested. I may try adding coffee to mine next time. Kathy, I definitely need to turn down the heat on the chili because that was the one criticism I had of the final dish. I need to go check out your recipe for some pointers. i am intrigued. coffee. COFFEE? i have not introduced my foreign roommate to the wonders of chili yet and if the weather would just please get cold enough, it would warrant me to attempt this Commitment Chili. Lan, this recipe may test the limits of your patience. But the end result is worth it. We have some hiding in the freezer, just waiting for a chill to creep into the air. Your photos are making me very happy and hungry! Tracy, after all the dishes have been washed and the chili has been ladled out into bowls, it makes me very happy too. I wish that our freezer were bigger so that I could make a bigger batch and freeze it off for enjoyment anytime. I’ve been craving big chunks of meat lately. Maybe it’s a Fall thing, maybe it’s all of the horror movies I’ve been watching over the past week…either way, my body is craving warm, hearty foods. I think I’m ready to make this commitment. Ohh, Ali I hadn’t even made the connection between Halloween, horror movies, and big chunks of meat. If you’re ready for the commitment, then I say do it. If I had been thinking, I would have served this up in some small hollowed out pumpkins for more of a Halloween feel. The picture is so stunning and it make me hungry instantly. I love the recipe…. and with coffee…how interesting! Tes, the coffee really isn’t prominent in the final dish. It just rounds out the flavors. Recipes like this need a disclaimer: PREPARE TO DIRTY EVERYTHING IN YOUR KITCHEN. Not that it’s a bad thing, you just need fair warning! Beth, I should have added that disclaimer text to the photo. Because you need to know up front that it’s going to get ugly. I think the inclusion of coffee is intriguing. I bake a lot, and have come across so many recipes that call for coffee. I’m always surprised at how much flavor it adds/enhances. I would think coffee might help tenderize the beef, but since it’s added at the very end, it must be more of a flavoring thing. I guess I’ll just have to try this recipe & find out! Sandie, I think the coffee rounds out the flavors of the chili much like it does with chocolate in baking. I really can’t recommend this dish enough. It will require time and patience but in my opinion, the effort is justified. I hope that you will give it a try and let me know what you think. I was going through the recipe list of ingredients nodding away & screamed to a halt with the coffee…, but then started thinking how it would zing up the tastes…., so intrigued in fact that I’m itching to make this…, love discovering new tastes. Anna, I hope that you will give this a try and that it won’t disappoint. You really won’t notice the coffee in the final dish but it will just make it all taste better. I love this – “6 Hour, 2 cutting board, 5 bowl, every utensil you have will be dirtied chili”. I hope you at least had a lot of leftovers! Also, I like that the recipe has coffee in it. Could you taste it? Jen you don’t taste the coffee in the final dish. I think it rounds out the other flavors nicely. I’d say I had about 5 quarts of chili and The Mistah and I took care of about 3 quarts before any got bagged for the freezer. Wow… That is some serious chili… But, it looks fantastic! Hey Jen, it is some serious chili. Perfect for a Sunday afternoon of football watching. This chili sounds amazing! I’ve used cocoa powder in chili before but never coffee – I definitely want to give that a try! Kitch, finally a dish that you can get into. Even if this didn’t appear at the party I hope you’ll give it a try soon. I made this chili a couple months ago after seeing the same episode, but I didn’t have the foresight to halve the recipe. I can back you up on the complete disaster it makes in your kitchen, the scrumptious results (melt-in-your-mouth beef! ), and you can’t taste the coffee, but it adds a bit of complexity hard to describe. Kristen, did you have a pot big enough to cook a full batch of chili? Now that I know how good the results are, I’m tempted to say what the heck and break out both dutch ovens so I can stock the freezer with this. Yes, exactly the coffee brings a complexity more than a flavor. So glad to hear from someone else who made a commitment to see this recipe through. Checking out my fellow Mobbie bloggers! Hello! This looks tasty. Hi Jen. Thanks for stopping by. And yes, this chili is quite tasty. Good luck with the Mobbies. I added a few of the nominated blogs to my reader. Love the disclaimer. and yeah that chili looks like it could knock the socks off of my pioneer woman chili! Elizabeth, this chili is superb. It’s the chili that I would want to serve at a dinner party. But I’ve never tried PW’s recipe. Hmmm, maybe we should have a holiday chili cookoff?